Well these are the dark days before Christmas and we’ve had a lot of rain this week. The sun goes down at about 4.00 pm so the evenings are long. Early last week a new baby arrived in our extended family so I’ve spent some time working on a baby quilt and I’ve finished the jacket for my son . Here are a couple of photos. 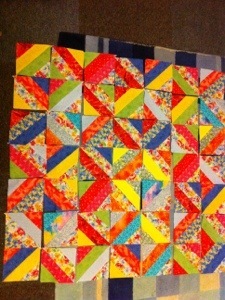 The quilt blocks have to be stitched together so that is a task for the week ahead. I’m also onto the sleeves for my cardi. DH’s hand is still not healed and is a bit infected so he was unable to ride yesterday. 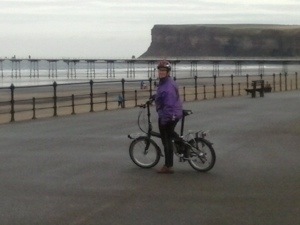 Saturday dawned with heavy rain and we had intended to cycle up to Saltburn for a Sustrans meeting. 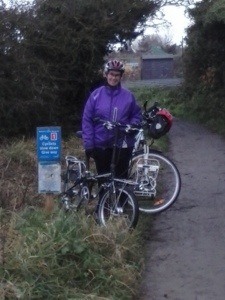 However, it started to dry up and we decided to put the bikes into the car and drive up there for the 11.30 am meeting. We discussed the proposed work on the old black path which is a 3 year project . My DH used to walk with his mam to Redcar using this path which I understand was a link to the steel works . After the meet DS and I cycled along to see the area that he helped clear last week so that a wild flower area can be established. I got him to take my photo here. We also were shown an alternative path to get down to the lower promenade. This avoids the 25% Saltburn bank which is a nightmare to cycle in traffic with its twists and turns. We rode along to the pier which earlier this year was decked out with knitted Olympics . Here you can see Huntcliffe in the background. Although we didn’t cycle very far we enjoyed what we did and it was easy to lift the Dahon into my car. The Scott wasn’t so easy but with 2 of us we managed. The gearing on the Dahon is starting to slip a bit in 5 and 6 th cogs which I suppose is due to the cable stretching and when DH’s hand is healed he will sort it for me. It’s great to have a handy chap around. I can’t believe you’ve done all that knitting in such a short space of time. It’s very impressive. Love the quilt too, what amazing colours. Nice pictures of you on the bike, and what a steep cliff in the background. Hi Campfire, thanks for your comment. I’ve been knitting for about 58 years so I’ve got the hang of it. 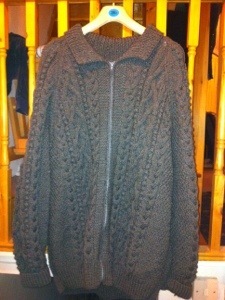 I was 6 years old when I knit my first jumper. Ma m sewed it up though . It was cherry red , chunky wool but I did all the increasing etc by myself. It took me about a week. Mind you I was a lot smaller then !! I hope DH’s hand starts to heal well soon…. Thanks Trevor . He’s back at the surgery tomorrow but it wasn’t looking good yesterday. He’s going stir crazy as its his right hand and he can’t do much.